Steven (Chicagoland, United States) on 1 February 2013 in Architecture and Portfolio. Another return to the series that I call "What's old is new again." 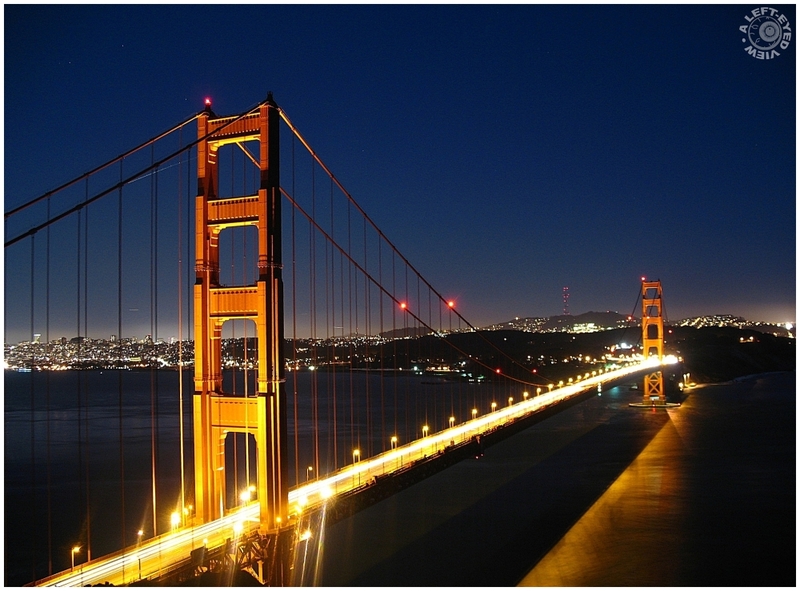 This was a nighttime capture of the Golden Gate Bridge in San Francisco that I photographed back on April 15, 2008. The original photo that I posted wasn't the greatest as far as detail and I thought that I would try to do some editing to bring out greater detail. What do you think? This has a much sharper and more defined look than the original. Lovely sharpness and clarity in the new version - and always a great shot! A beautiful night capture of this magnificent bridge. You did very well in editing the new version with much more clarity and sharpness in the new version. Well done ! Wow, your processing since then has greatly improved, Steven. You've turned a snapshot into a masterpiece. Well done! The new version is much improved. Excellent work ! I think you did a great job! You already had a great composition with this deep blue sky contrasting with the elegant golden silhouette of the bridge, and you just add this little extra sharpness that makes it fantastic! Oui ! Celle-ci est beaucoup plus nette ! Excellent ! Fantastic difference! Well worth the effort to re-work it! It definitely improves the previous one in my opinion. Excellent post-processing work. This bridge deserves its name. Shining and glowing. Brilliant point of view and brilliant compo Steven. Well, this one is the best. Well done! Fabulous light in this lovely image. A very beautiful light !! Looking at our photos from 2008 ...sure we do something else now !! Gorgeous view of the illuminated bridge and land; the lighting on the water is amazing! Amazing the difference! This is just beautiful! I love the color. Fantastic processing! Definitely better sharpened and slightly better highlight control. An already lovely photo improved. I checked out your original one, this one is better! Superbe composition, angle de prise de vue et lumière nocturne! Congrats on your spotlight ! Really nice one ! Splendid light. Congrats on the Color Spotlight. Congratulations on your SPOTLIGHT! well deserved!!! Congratulations on the Spotlight Steven! Well deserved! Congratulations on this well deserved Color Spotlight Steven !!! Oh yes, this version is much crisper. Congratulations on the Color Spotlight! Congrats on the Color Spotlight! Congratulations ... your re-processing definitely worked wonders! ...and congratulations on the color spotlight ! Congratulations on your Spotlight. Well deserved ! @JDY: Thanks, JD! Just click on the link (highlighted in green) in the text above and it will take you to the original photo taken in 2008. Congratulations on the Color Spotlight, Steven ! That sure is a gorgeous scene, providing you with some really excellent shots...The detail is much better and clearer in this image than the previous one. I like it a lot. Well done! Félicitations pour le spotlight !